Henri’s Reserve, a curated e-Boutique of Family Estate Champagnes. 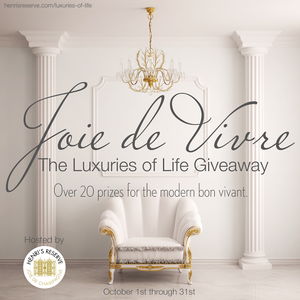 We cater to those looking to indulge in the luxuries of life – that’s why we are hosting an extravagant multi-brand giveaway called Joie de Vivre: The Luxuries of Life Giveaway and we’d love to include you as one of the brands. Coordinated by our social media agency, this Giveaway is a special opportunity to get the amazing benefits listed below. The giveaway will reward one lucky winner a grand prize of the luxurious products we love. Each brand will give away one prize drop-shipped to the winner. To enter people must like your Facebook page and there are other ways to earn entry points like tweeting, sharing on Instagram the graphic showing all the prizes, visiting your website and telling us what feature they like best (example), and more. The giveaway will run from mid October into November. I'm afraid I must insist on a deadline for all brands. Please RSVP by October 14th by completing the form below. First, here is why you should sign up! Huge Exposure – Countless Facebook pages will be promoting on social media along with all participating brands promoting the giveaway, too! We have also partnered with several high traffic bogs and media outlets which will also promote the giveaway to get you even more exposure. More Facebook Fans – to enter people must like your Facebook page so you can continue to market to entrants long after the giveaway is over. Increased Website Traffic - we will add other creative ways for people to earn entry points to win such as visit your website and tell us what feature they like about your product. Press Release Featuring All Brands and Sponsors – we will create and send a press release to thousands of high-end and sophisticated media contacts! Your brand will be in the press release with a description, image, and your website URL. Special Raffle for All Participating Brands – any brand who participates will be sent a link to enter a special giveaway to thank you. Enter to win a FREE press release by our PR gal, Tasha Mayberry. Free Marketing eBooks – all brands will also receive two special eBooks “Marketing 1, 2, 3! Secrets to Successful Marketing in the New Digital Era” and "10 Secrets to Successful PR"
PR Star Bootcamp - free access to the PR Star Bootcamp Starter Course (when released in the fall); a special video training to teach you how to get mentioned in the media, position yourself as a go-to expert, drive traffic to your website, and grow your business. Complete the form below to sign up and contact Tasha Mayberry at pr@henrisreserve.com with any questions. *What product do you want to give away?